THE end of Seaford pier has been fenced off since late 2016 and there is no end in sight to it being reopened to the public. Parks Victoria closed access to the end of the pier in December 2016 and there is no sign the state government agency is in any hurry to make pier repairs. 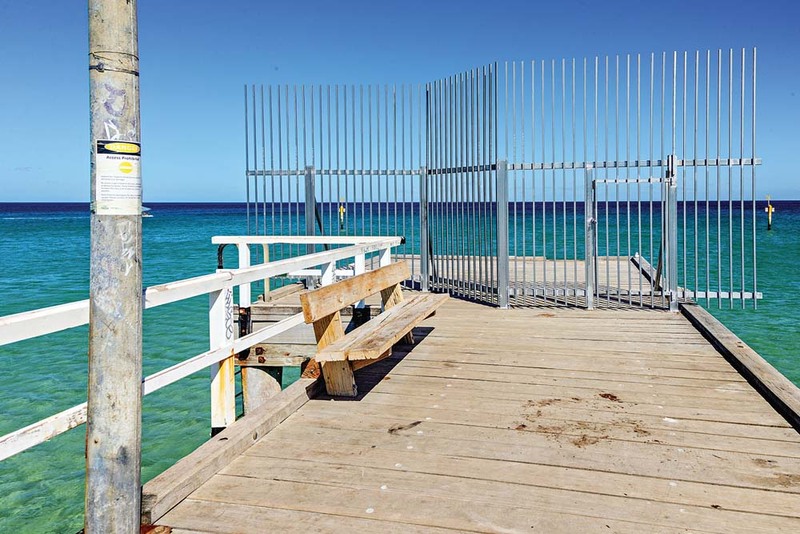 Seaford resident Darren Gyss said he often swims near the pier and has been chasing Parks Victoria for an answer on when the pier will be fully open to the public. He said several temporary fences have come and gone and yet no work has been done to repair the pier for more than a year. “They seem more interested in putting up cyclone fences than fixing the actual problem. Why can’t it be fixed?” Mr Gyss asked. He said a ladder on the pier had “come loose” and has been “taken away” and there has been no replacement. Parks Victoria did not answer several questions before publication deadline, despite being given more than two days’ notice to do so, about why the pier needs to be repaired and when the pier end will be reopened to the public.